The woven PET construction provides flexibility, spring back and high resistance to abrasion. 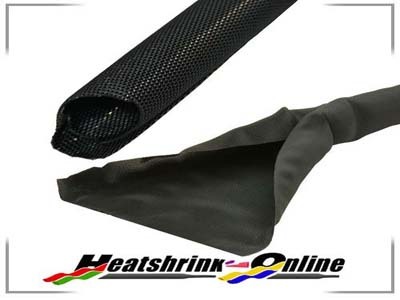 It is designed to protect wiring, cables, pipes, hoses and foam insulation from mechanical degradation arising from exposure to touch conditions in vibrating installations. The sleeving is installed by opening up the sleeve, feeding over the application and releasing. Once fitted, it is fixed at one end, twisted, creating a firm, snug fit and finally fixed at the other end. Breakouts in harnesses are simple and fast to construct. Resistance against chemicals: Alcalescent or weakly acidic materials, oils, fats, aliphatic and aromatic hydrocarbons. Unstable: Strong acidic or alkaline materials, longer impact of hot water.